Is james brolin on the premises? I've seen The Amityville Horror enough times to know that something supernatural must be going in Houston's Minute Maid Park. First Shawn Chacon snaps and tackles Astros' GM Ed Wade in the home clubhouse, where an attempted strangling may or may not have occurred. Chacon was shipped to the North Pole the next day. 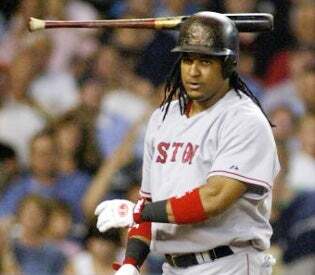 And now it comes to light that Manny Ramirez went after the Red Sox traveling secretary on Saturday in the Minute Maid visitors' clubhouse; knocking him to the ground when Ramirez was told that he wasn't going to get the number of complimentary tickets he had requested. Manny Ramirez shoved Red Sox traveling secretary Jack McCormick to the ground in an argument over Ramirez' ticket allotment. Several onlookers moved quickly to separate the two. Ramirez had asked McCormick for 16 tickets for Saturday night's Red Sox-Astros game, an unusually high number for day-of-game. In addition to handling all travel details for clubs, traveling secretaries also take player ticket requests for both home and away games. When McCormick cautioned Ramirez that he might not be able to fulfill his request, Ramirez responded by shouting: "Just do your job!" An argument ensued and Ramirez pushed McCormick, sending him to the ground.